Makes a great Holiday Gift....Includes one glass of wine/cheese & crackers! Class will start PROMPTLY at 6pm. PLEASE ARRIVE 15-20 min. prior to class starting. Fun for the absolute beginner to the seasoned artist! 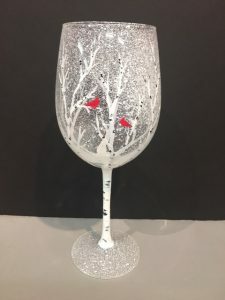 Spend an evening of creativity as painting two Winter Cardinal themed themed wine glasses! Feel free to bring your own wine (21 and older) to sip while you paint! We use special paint that will adhere to glass and won't come off. Our instructor will guide you step by step- easy, stress free, & affordable! $45 all supplies included. We will provide you with a smock, but please wear clothes you wouldn't mind getting paint on!